^ NU'EST《SMASH HITS最精選》快問快答 白虎篇. 台灣華納日韓官方頻道. 2013-01-15 [2017-05-16]. ^ [MV] AFTERSCHOOL - Play Ur Love M/V (Unit Ver.2). PLEDIS OEEICIAL. 2011-05-16 [2017-05-16]. ^ AfterSchoolBoys成員公開. kpopn. [2017-08-23] （中文）. ^ 이혜미. 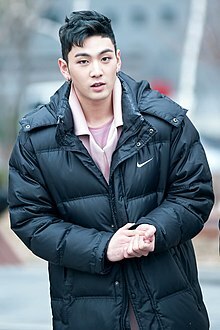 ‘프로듀스101’ 강동호, 주학년 전담 트레이너로 변신. tvreport. [2017-08-23] （韩语）. ^ 이다래. 연예 '프듀2' 무대 MR 제거 영상에서 혼자 음원 튼 것 같다는 강동호. [2017-08-23] （韩语）. ^ 23.0 23.1 BUMZU迷你3辑歌单公开 NU'ESTW白虎参与创作. bnt news. [2017-12-22]. ^ NU’EST W新专辑《WHO·YOU》收录歌曲歌名公开. KBS World Radio. [2018-07-06]. This page is based on the Wikipedia article 姜東昊; it is used under the Creative Commons Attribution-ShareAlike 3.0 Unported License (CC-BY-SA). You may redistribute it, verbatim or modified, providing that you comply with the terms of the CC-BY-SA.